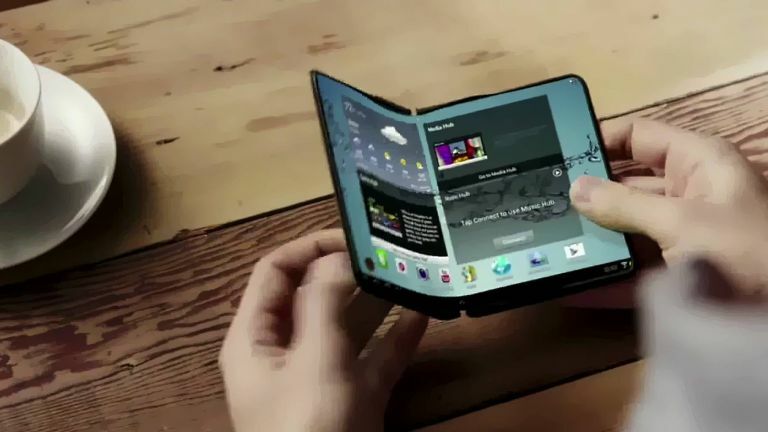 Samsung is planning to release its much-anticipated Galaxy X folding smartphone, code-named internally at the South Korean maker as "Winner", in 2019. The news was originally reported by the Wall Street Journal, and seemingly confirmed - or at least given more weight - by a Samsung patent filing. It seems the phone will feature a 7-inch main screen that can be folded in half like a wallet. Once folded, the phone then reveals a secondary smaller display on the outside, which takes the form of a display bar. How’s THAT for innovation? Now, this is interesting for two main reasons. Firstly, many of these features were already called by T3 months ago, from the fact that it was going to have a display on the exterior and a 7-inch main screen, through to the fact that Samsung had set the Galaxy X release date in 2019. And, secondly, as highlighted by LetsGoDigital, the description of the Galaxy X in the Wall Street Journal report, almost exactly matches a patent for a folding device filed by Samsung and published originally in March 2017 - a patent that was, coincidentally, only recently republished on 11 July 2018. And, simply put, the similarities are remarkable, potentially giving us an incredibly detailed early looks at exactly how the S10 will operate. The details of the patent visualised match very closely with current descriptions of the Galaxy X. As can be seen in the above and below images, which are representations of patent's contents, the patent clearly details a folding phone with a "hidden display" on the rear, which only becomes noticeable once the device is folded in two. And, talking of being folded in two, this device folds in two just like a wallet. According to the patent a 6-axis sensor measures which orientation or position the phone is in at all times, meaning that when the phone is folded it knows it and, as shown in the image below, can automatically extend the size of the second display to enable extended functionality. The secondary display will be able to expand and contract, as well as show different apps and tools. As you can see, the content shown on the Galaxy X's secondary display varies depending on how much of it is currently visible, which itself is dependent on which orientation the phone is in. If only a small part of the secondary display is visible, then the screen is brighter and the icons are smaller, for example. Interestingly, the patent also details that the main, folding, 7-inch display can display the same information as the secondary display, and that the Galaxy X-style device would also be compatible with Samsung's S Pen digital stylus. Message could be read and responded to without opening the Galaxy X. What isn't mentioned in either the Wall Street Journal report or this folding phone patent is the Samsung Galaxy X price, which is reportedly going to be right at the top end of the premium market. Your current rumoured price of entry? £1,365. Well, if you want to early adopt the New Precious Things, you have to pay. We're now even more excited to go hands on with Samsung's Galaxy X folding smartphone, which hopefully we will see in the flesh either at CES 2019 or MWC 2019.